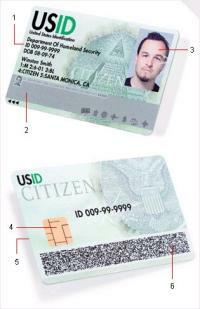 An article in Popular Science about what a national ID would look like and contain. On the issue of social security numbers on ID card, they mention that even though social security numbers on ID cards have been rejected by the federal government, "it's a good guess the Department of Homeland Security would manage it". For example, an ER doctor could view medical information and enter data about treatment (if the card's data storage device is read-write capable), but could not see security-related data (such as a traveler's flight history, or a non-citizen's visa status) that an airport or INS official might require. But how secure are smart cards? Detailed instructional hacking sites can be found on the Web, many focusing on European cards. And the more data on a card, the more valuable the card becomes to an identity thief. Yup. This is definitely a risk. I wonder how many terrorists would actually use un-forged ID cards when traveling? Joi Ito - "National ID Card Technology - Popular Science" by Joi Ito is licensed under a Creative Commons Attribution 4.0 International License.